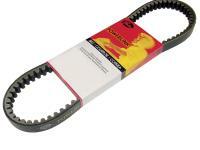 Gates Powerlink Premium CVT Drive belt size 669-18-30. Poly Cord, Premium EPDM Construction Commonly found on GY6 50cc 4-stroke QMB139/QMA China engine based scooters. Fits Twist N Go Venice 49cc, Twist N Go LS 49cc and Twist N Go Milano 50 (49cc) 2004-2007, Qingqi QM50, Tao Tao 50cc 4T, Kinroad 50cc, Jonway 50cc 4T, Roketa 50cc 4T, SunL 50cc 4T, ZNEN 50cc 4T, Baccio Scooters, Excalibur 50cc 4T, and more!